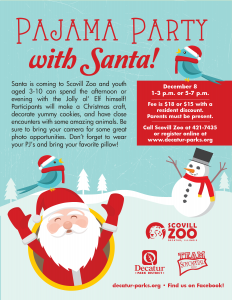 Kids aged 3 – 10 can bring a pillow, wear PJ’s and visit with Santa and Mrs. Claus while they make an ornament, decorate cookies, and enjoy an animal presentation! 156560-18 3 - 10 Sat. December 8 1 - 3 p.m.
156560-24 3 - 10 Sat. December 8 5 - 7 p.m. Call the zoo at 421-7435 to register or visit the online registration page here.